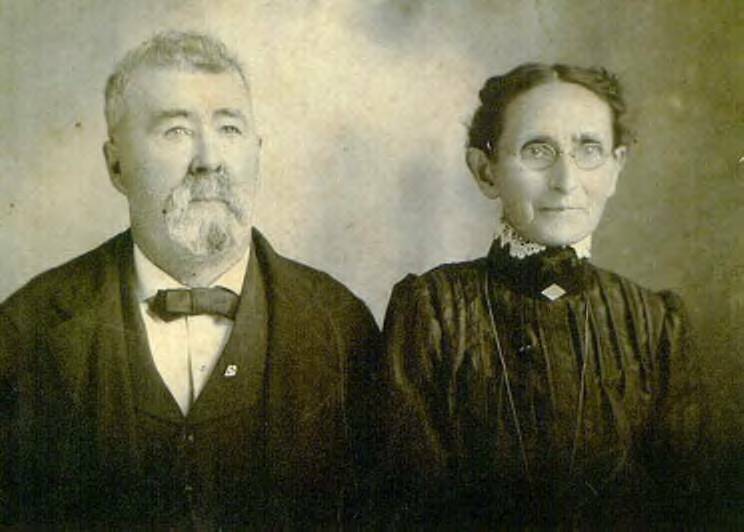 William Randolph Mayfield and his wife Sarah Amanda Davis ca. 1900. 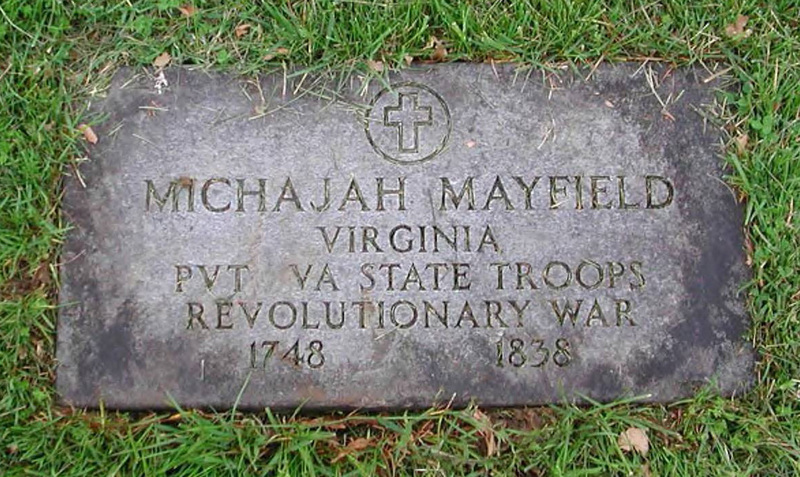 Tombstone of Micajah Mayfield (1748-1838), Revolutionary War Veteran. The surname Woolf, also spelled Wolf and Wolfe, is apparently of German Palatine origin. Some of the earliest official records, pertaining to people with this surname, come from the northern part of the Shenandoah Valley of Virginia, in the neighborhood of the modern town of Winchester. In the last third of the 18th century, members of this family migrated south, along the Great Philadelphia Wagon Road, into southwest Virginia, Washington County, North Carolina (now in Tennessee) and into the area which became, in 1786, Greenwood County, South Carolina (SC). After the Revolution, Mary Woolf, daughter of Henry Woolf, married John Mayfield in Greenville County SC. In the late 1790's, this couple, along with several Mayfield and Woolf family relatives, removed to the Pitman Creek area of southern Kentucky. The Pitman Creek area became part of Pulaski County, when that county was formed in 1798. I personally have not done any detailed research on this family. 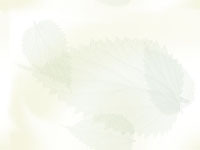 The information contained in the following family tree report is mostly based on: 1) material graciously provided to me by John King Woolf of Baton Rouge, Louisiana and 2) from the papers of Ella Mayfield Taylor of Lexington, Kentucky (now maintained by the Pulaski County Historical Society). Mrs. Taylor was a great-granddaughter of Mary Woolf Mayfield (d. 1848). I have reviewed the Revolutionary War pay records of South Carolina (the so-called "Audited Accounts") for Woolf family members. In addition, I have selectively reviewed the 1790 and 1850 Federal Census Reports for South Carolina and Alabama, respectively. The tables, shown below, summarize my findings. Henry Wolfe A. A. 8770 Served in the SC Militia during 1780 - 1782, under Capts. Parson and James, and Col. Roebuck. Mathias Woolf A. A. 8712, 2528, and 6835 Served in the German Fusiliers of Charleston in 1775 and as an express rider for the Whig forces in 1776, 1780 and 1781. In 1782 he served as a cattle drover. 1. HENRY1 WOOLF He married MARY (POLLY) SEABURN. 2. i. HENRY2 WOOLF, b. Abt. 1745, Virginia Colony; d. 03 October 1823, Marengo County AL. 2. HENRY2 WOOLF (HENRY1) was born Abt. 1745 in Virginia Colony, and died 03 October 1823 in Marengo County AL. He married ELIZABETH MITCHELL 1763 in Virginia Colony. i. HENRY3 WOOLF, b. 1765; d. 1835, Alabama; m. REBECCA BRUCE, 1787. 3. ii. FIELDING WOOLF, b. 1769, Virginia Colony; d. 1841, Pettis County MO. 4. iii. MARY WOOLF, b. 1770, Virginia Colony; d. 08 December 1848, Pulaski County KY.
iv. WINIFRED WOOLF, b. 1772; m. WILLIAM DUNCAN. v. LEWIS WOOLF, b. 1778; m. NAME UNKNOWN, 04 August 1801, Christian County KY.
vi. BRUNETTA WOOLF, b. 1782; d. 1813, Jefferson County MS; m. WILLIAM SELMAN. vii. CLARA MAY WOOLF, b. 1783; m. SAMUEL HARMON, 1802, Christian County KY.
viii. ALFRED WOOLF, b. 1784; d. 17 July 1837, Christian County KY; m. MARY (POLLY) BOND, 26 June 1811, Christian County KY.
5. ix. REDDING WOOLF, b. 1785; d. 1823, Marengo County AL. 6. x. JAMES BRANDON WOOLF, b. 05 October 1789, Greenville County SC; d. 30 November 1873, Marengo County AL. xi. ELIZABETH (BETSEY) WOOLF, b. Abt. 1797; m. JOHN FREEMAN. 3. FIELDING3 WOOLF (HENRY2, HENRY1) was born 1769 in Virginia Colony, and died 1841 in Pettis County MO. He married RUTH _____. 4. MARY3 WOOLF (HENRY2, HENRY1)1 was born 1770 in Virginia Colony, and died 08 December 1848 in Pulaski County KY. She married JOHN MAYFIELD1 1788, son of ISSAC MAYFIELD and MARGARET BRUMETTE. He was born 1768 in Virginia, and died 1813 in Pulaski County KY.
i. FRANCES4 MAYFIELD, b. 02 November 1790, South Carolina; m. EDWARD BUCHANAN, 30 April 1817, Pulaski County KY.
ii. REUBEN MAYFIELD, b. 03 February 1792, South Carolina; m. CHARLOTTE BOONE, 27 October 1814, Pulaski County KY.
iii. PLEASANT MAYFIELD, b. 19 February 1794, South Carolina; m. JANE BUCHANAN, 20 March 1821, Pulaski County KY.
iv. HENRY MITCHELL MAYFIELD, b. 16 November 1795, Knoxville TN. v. SEABURN MAYFIELD, b. 25 May 1798, Pulaski County KY; m. MALINDA BURGE, 17 February 1821.
vi. CLARENDA MAYFIELD, b. 29 July 1800, Pulaski County KY; m. AMBROSE HENDRICKSON, 14 January 1824, Pulaski County KY.
vii. ARTEMACY MAYFIELD, b. 02 October 1804, Pulaski County KY; m. ADAM SURBER, 10 October 1829, Pulaski County KY.
7. viii. ALFRED MAYFIELD, b. 16 May 1806, Pulaski County KY; d. 11 April 1886, Pulaski County KY.
ix. ELIZABETH MAYFIELD, b. 04 June 1808, Pulaski County KY; m. GEORGE CUNDIFF, 20 June 1828, Pulaski County KY.
x. ALLJOURNAL SIDNEY SMITH MAYFIELD, b. 28 January 1811, Pulaski County KY.
5. REDDING3 WOOLF (HENRY2, HENRY1) was born 1785, and died 1823 in Marengo County AL. He married ELIZABETH MATLOCK 1813 in Christian County KY.
6. JAMES BRANDON3 WOOLF (HENRY2, HENRY1) was born 05 October 1789 in Greenville County SC, and died 30 November 1873 in Marengo County AL. He married (1) LEVICEY COOK 04 January 1817 in Jefferson County MS. She died Abt. 1845 in Alabama. He married (2) MARTHA _____ Abt. 1846 in Marengo County AL. 8. i. THOMAS JEFFERSON4 WOOLF, b. 1817, Mississippi. ii. HENRY ASHBY WOOLF, b. 24 April 1826, Marengo County AL; d. 31 October 1879, Marengo County AL; m. FRANCES GHOLSON, Abt. 1850, Alabama; b. 1838, Alabama. iii. JAMES WOOLF, b. 1831.
iv. FRANCES WOOLF, b. 1836.
v. JANE A. WOOLF, b. 1839.
vi. MILDRED WOOLF, b. 1843. 7. ALFRED4 MAYFIELD (MARY3 WOOLF, HENRY2, HENRY1) was born 16 May 1806 in Pulaski County KY, and died 11 April 1886 in Pulaski County KY. He married ELIZA ADAMS Abt. 1830, daughter of ALEXANDER ADAMS and MARY MORROW. She was born 07 September 1804, and died 02 November 1872 in Pulaski County KY.
i. ADALINE5 MAYFIELD, b. 22 December 1831, Pulaski County KY; d. 15 June 1857, Pulaski County KY; m. G. EUBANKS. ii. ALEXANDER ADAMS MAYFIELD, b. 09 August 1833, Pulaski County KY; m. SARAH ANGELINE _____, May 1889.
iii. MARY MAYFIELD, b. 15 March 1835.
iv. ELIZABETH JANE MAYFIELD, b. 03 April 1837; m. THOMAS WRIGHT, April 1884.
v. REBECCA MAYFIELD, b. 15 December 1839.
vi. JOHN C. MAYFIELD, b. 13 March 1842.
vii. HENRY C. MAYFIELD, b. 13 July 1844. 9. viii. ZACHARY TAYLOR MAYFIELD, b. 19 February 1847, Pulaski County KY; d. 06 December 1902. 8. THOMAS JEFFERSON4 WOOLF (JAMES BRANDON3, HENRY2, HENRY1) was born 1817 in Mississippi. He married LUCY ANN WALTHALL 1841. She was born 1820 in Virginia. i. JOSEPHINE5 WOOLF, b. 1842.
ii. WINFIELD WOOLF, b. 1843.
iii. FLORENCE WOOLF, b. 1847.
iv. HENRY WALTHALL WOOLF, b. 06 March 1856, Marengo County AL; d. 11 May 1944, Marengo County AL. 9. ZACHARY TAYLOR5 MAYFIELD (ALFRED4, MARY3 WOOLF, HENRY2, HENRY1) was born 19 February 1847 in Pulaski County KY, and died 06 December 1902. He married ELIZA MARGARET MCCLURE June 1870. She was born in Pulaski County KY.
i. JOHN ADAMS6 MAYFIELD, b. 04 May 1871; d. 19 September 1930; m. FLORENCE GASTINEAU; b. 11 November 1886; d. 25 May 1921.
ii. MARY MCCLURE MAYFIELD, b. 28 January 1873.
iii. ELLA ALICE MAYFIELD, b. 13 August 1874; m. L. N. TAYLOR. iv. NETTIE CAMPBELL MAYFIELD, b. 03 April 1876.
v. MATTIE SUSAN MAYFIELD, b. 28 September 1877; d. 06 September 1956.
vi. MINNIE BLAINE MAYFIELD, b. 05 August 1884.
vii. CHARLES SHIELDS MAYFIELD, b. 31 May 1886; m. JEANIE EDITH CLIFTON; b. 27 September 1886.
viii. ALEXANDER CLAY MAYFIELD, b. 19 November 1887.